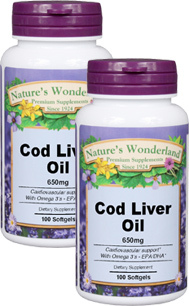 Cod Liver Oil - 650 mg, 100 softgels each (Nature's Wonderland) - Penn Herb Co. Ltd.
Now it's easier than ever to support heart health with our high potency Cod Liver Oil! It supplies naturally occurring Omega-3 Fatty Acids, EPA and DHA and has a long history of traditional use for the support of overall health and well-being. The natural Cod Liver Oil used in our softgel is manufactured under strict quality control standards. It is tested to be free of potentially harmful levels of contaminants (i.e. mercury, heavy metals, PCB's, dioxins, and other contaminants. Reap The Heart-Healthy Benefits of Fish Oil Without The Unpleasant Taste! Supports cardiovascular health; source of Omega-3 Fatty Acids, EPA (Eicosapentaenoic Acid) and DHA (Docosahexaenoic Acid, which play an important role in heart and cardiovascular health as well as cognitive function. Excellent source of vitamins A & D-3 (help maintain strong bones, teeth and vision health). As a dietary supplement, take 1 soft gel daily, preferably with a meal.